Take home this beautifully boxed set, which includes a 50ml mini bottle of George Washington’s Rye Whiskey® and a commemorative shot glass. The mash bill, or recipe, was discovered by researchers examining the distillery ledgers for 1798 and 1799. His whiskey consisted of 60% rye, 35% corn and 5% malted barley. The records also indicate that George Washington’s whiskey was distilled at least twice before being sent to market. In Washington’s time whiskey was not aged and was sold in its original form. The whiskey in this bottle accurately represents that process. 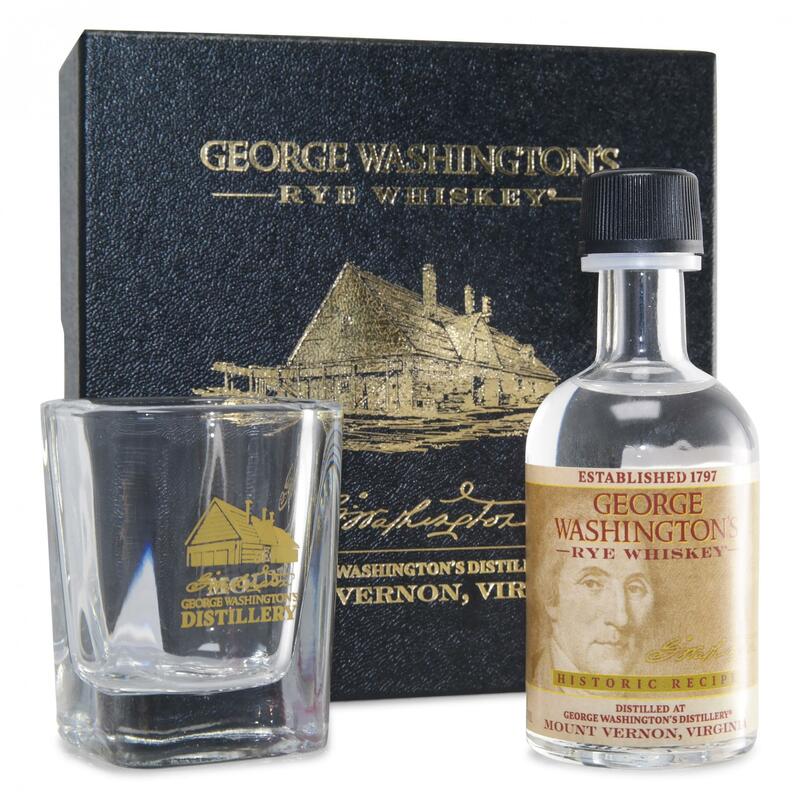 This boxed gift set includes a 50 ml mini bottle of George Washington’s Rye Whiskey® and a commemorative shot glass. The black textured box is embossed with gold foil featuring the image of the distillery and has a rich burgundy foam insert. The clear, square shot glass has an image of the distillery with George Washington’s signature and “George Washington’s Distillery” printed in 22K gold ink. Shot glass and gift box are made in America. George Washington’s Rye Whiskey® is the official state spirit of the Commonwealth of Virginia. Available in 375ml bottles and mini-bottle gift set! George Washington’s Rye Whiskey®, the official state spirit of the Commonwealth of Virginia, received a silver medal at the 2019 American Craft Spirits Association Awards — a top award among white (unaged) whiskies nationwide. • All whiskey and brandy purchases must be made in person with a valid photo ID. Must be 21 years or older. No exceptions. • You may access The Shops (in the Mount Vernon Inn Complex) without an admission ticket. Parking is free. • Virginia ABC law prevents us from shipping whiskey or brandy purchases, nor can we accept checks for, or discount whiskey and brandy. Browse products inspired by George Washington's Distillery. Did you know - In 1799, George Washington's distillery produced nearly 11,000 gallons, making it the largest whiskey distillery in America at the time!